T Hilly, CEO and President of Kush Entertainment along with Mack Maine take you behind the scenes of Lil Wayne’s Young Money empire which consists of Lil Wayne, Mack Maine, Currency, and Dizzy. 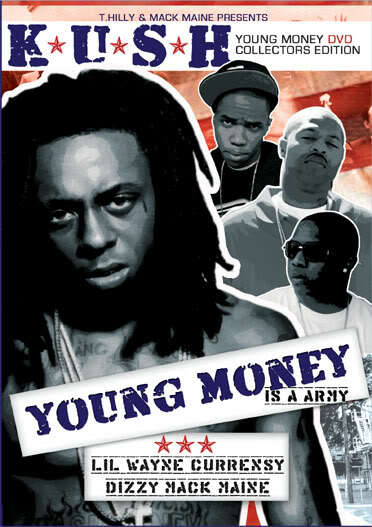 This exclusive DVD shows you a side of Young Money that you never see. Take a good look at New Orleans before Katrina wiped out the city. The last memories of the city were spent with Lil Wayne’s Young Money artists in the very neighborhoods they grew up in. See videos of these artists you wouldn’t see elsewhere. Also witness an exclusive battle between Butter and Snoop as they cage off in the infamous ‘Cage.’ See New Orleans how it used to be fore the last time. K.U.S.H. Entertainment’s T Hilly and Mack Maine take you behind the scene of Lil Wayne’s hip-hop empire: Young Money. Consisting of Weezy F Baby, Mack Maine, Currency and Dizzy, this exclusive DVD shows you a side of Young Money that you will never see. 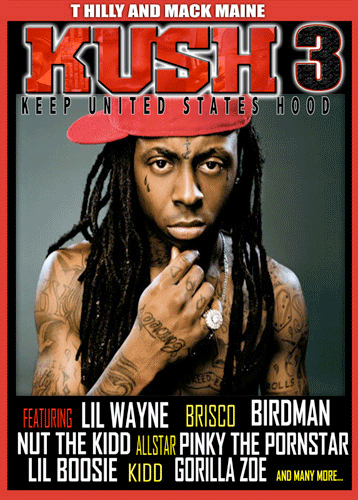 Taking you to Hollygrove and the projects all around the hood where Weezy grew up, this DVD brings you all-new footage of Lil Wayne and his Young Money family, as well as exclusive features with Lloyd, Young Dro and Jim Jones. Kush DVD Volume 3 is finally here! 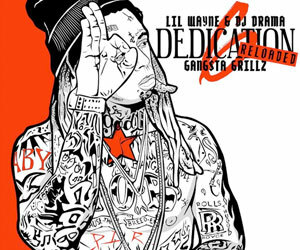 And once again it’s a Lil Wayne and Young Money presentation. K.U.S.H. creator, director and producer T. Hilly and Lil Wayne’s first Young Money artist Mack Maine are back again with their third installment of the Kush DVD series which documents the life of Lil Wayne and the rich and famous lifestyles of the Cash Money/Young Money artists. Witness Lil Wayne’s private XXL photo shoot “live” in one of the most dangerous neighborhoods in the world – his hometown city of New Orleans, uptown on Valence and Magnolia. This photo shoot takes place in front of Birdman’s mother house, the very house Birdman grew up in as a kid. 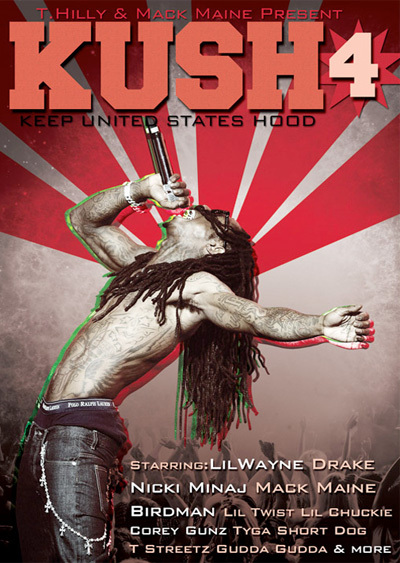 This DVD also includes two never before seen Lil Wayne music videos including “Sky is the Limit” and “I’m Me” from the platinum-selling album the “Tha Carter III” only on the Kush DVD. When Mack Maine is behind it you know it’s official. Lil Wayne also speaks on him winning the Viewer’s Choice Awards and also explains to you who he looks up to in the rap game. Lil Wayne also speaks on the “Hot Boys” and how it was growing up with them and without them. 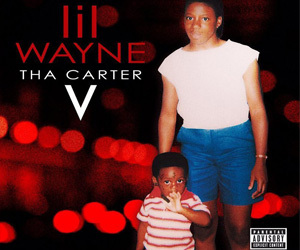 Weezy later checks in with exclusive “Carter III” live performances in front of a sold out arena, as he gives a performance of a lifetime for all those in attendance. Lil Wayne is in his rawest form on this DVD and no one has caught him on camera like this ever before. Mack Maine checks in with an exclusive Hot 16 and rips the stage with Lil Wayne together as they perform their hit single “Got Money” ft. T- Pain. Also featured in this DVD: Brisco Opa Locka Goon drops in a hot “32” bars and speaks on joining the Cash Money family. Gorilla Zoe drops a hot 16 and also Lil Boosie checks in live from Baton Rouge. 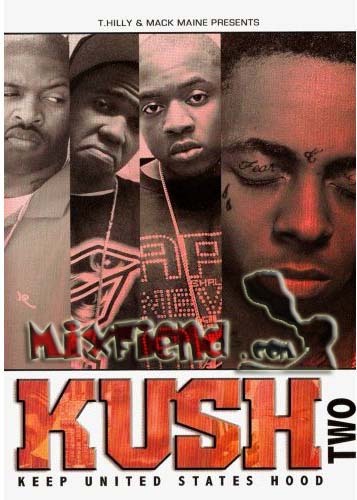 Nutt Da Kidd also has an exclusive never seen before video on Kush DVD #3.